OpenStreetMap. Basically a map of the world, which anyone can edit and use. What is it used for? How can public administration, whose own maps are also very accurate, benefit from it? And how could the contents of OpenStreetMap be enriched with open data? In Finland, there is a lot of open geographic information material, high-quality geographic information skills and active utilisers. Many are already utilising both OpenStreetMap (OSM) (OSM) data and geographic information of cities. But could the public administration and the OSM community benefit even more from each other’s data? OSM activities and public administration’s open geographic information, geographic information needs and OSM experiences were presented at the Helsinki Loves Developers event on 4 October 2018. OpenStreetMap (OSM) is a free and open world map, which is created, maintained and owned by the community. The map can be freely utilised for your own purposes of use, as long as the source is mentioned. It can also be easily edited by anyone who is interested. The map can be utilised e.g. in Qgis geographic information software using the QuickOSM plugin. In addition to its precise and editable background map, OSM offers a routing capability, which the own services of even large cities is often lacking. 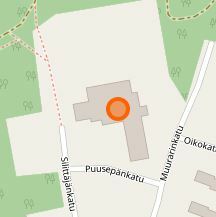 In Finland, many active users complete and edit the OSM map. Information about OpenStreetMap editing events can be found, for example, on Facebook in the HOT-OSM Finland group. Finland’s largest cities have been covered rather extensively in OSM, but smaller localities and rural areas are lacking a lot of data, such as buildings. Even though the maps of the largest cities are quite precise, there are still themes of objects and map layers to improve in them as well, tells Erno Mäkinen at Gispo Oy. Many Finnish web services, such as the Helsinki metropolitan area Service Map, the BlindSquare mobile app and Sokos Hotels, use OpenStreetMap as their background map. 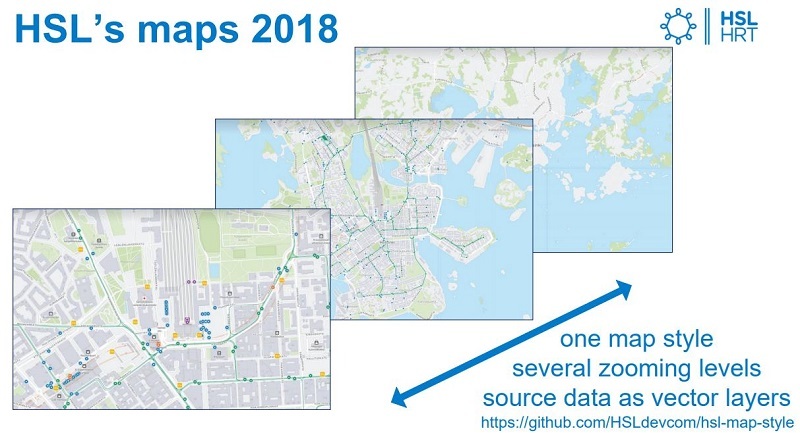 Even though the public administration produces maps of high quality, some services of the public administration, such as Helsinki Region Transport’s Journey Planner and bus stop maps use OpenStreetMap as their base map. Markku Huotari from Helsinki Region Transport says that one of the biggest reasons for using OSM in the Journey Planner is its flexibility and multiple layers. If needed, OSM can also be edited quickly and thanks to the community of editors, you do not have to do all the edits yourself. OSM can also offer a new channel for sharing and validating data. As a negative side to things Huotari mentions the uncertainty concerning the quality of the data. Helsinki Region Transport collaborates with the OSM community, for example, by offering Helsinki Region Transport data as a part of OpensStreetMap. The many layers of OpenStreetMap enable a uniform layout. Finnish national road and street data system Digiroad, maintained by the Finnish Transport Infrastructure Agency, offers information about Finland’s road and street network as open data. The data can be utilised through either the Agency’s service or the Oskari platform. Meri Lindholm from Sitowise Oy tells that OpenStreetMap is now in pilot use as a new publishing channel for the Digiroad data. The pilot project includes e.g. the importing of public transport stops into OSM. There was also a mapathon on the topic at the GIS Expo in November 2018 and the aim was to publish the data during 2018. As for the challenges in her work, Lindholm mentions the adaption of data models and geometrics. The different licenses bring their own reasoning to the table. The Creative Commons 4.0 open data license allows free use of data anywhere, as long as the original creator of the data is attributed credit. The Open Database License (ODbL) used in OpenStreetMap requires that possible additions or changes are shared with the same license. The discussion concerning the utilisation of OSM data in cities and the utilisation of open data provided by cities in OSM continues. In addition to acknowledging the licenses, the data brought from OSM to services of the public administration needs to be quality checked. What kind of city open data could be utilised in OpenStreetMap? Could the cities use OSM data? And what kind of data should be opened and shared through OSM? The participants discussed and threw around ideas about the co-operation opportunities between OSM and the cities. Surprisingly, many people had similar thoughts. OpenStreetMap is still lacking information about, for example, street ploughing, traffic signs, accessibility calculations and different kinds of areas, such as green areas and conservation areas. The Service Map’s information about public services could also be added to OSM to a wider extent. The city’s newest orthophotographs could be imported there as well. The data requests expressed towards the cities included information on the street conditions, work site locations and traffic announcements, accidents and congestions. One thought was to integrate data from the cities with information available in OpenStreetMap for the benefit both parties. For example, OSM could include a more precise bicycle and pedestrian network, based on real used routes and possible unofficial shortcut paths. Sometimes, temporary traffic arrangements are also updated faster to OSM than to the maps of the city. Supplementing OpenStreetMap is surprisingly straightforward. At the end of the event, we were able to try updating OpenStreetMap. With curiosity, I opened OSM in my browser and created a username. I am only vaguely familiar with geographic information, but perhaps I could learn even a bit about OSM? First, there was a tutorial which was very clear and gave me a hands-on tour of the basics of OSM. Encouraged by the simplicity, I browsed to my childhood landscapes and noticed that my old school was just a dot on the map. I drew the outline of the building based on an aerial photo and after that, the OSM world was one building more complete. Content, I surfed in the editor view to find the next editing object and, by accident, pulled the playground next to the school into the lake nearby. Fortunately, that did not matter; Erno Mäkinen showed me how the park could be returned to its proper location. He told that similar accidents happen from time to time, but that the map objects can easily be returned from the history tab. Erno Mäkinen: OpenStreetMap – What and why? “Cities have opened a lot of geographic data during the last few years. The significance of crowdsourced map data is still being considered in the cities, but has potential benefits for both the cities and OSM”, says City of Helsinki’s GIS-expert Outi Hermans.